The Lotus Sūtra (Sanskrit: Saddharma Puṇḍarīka Sūtra, literally Sutra on the White Lotus of the Sublime Dharma) is one of the most popular and influential Mahayana sutras, and the basis on which the Tiantai, Tendai, Cheontae, and Nichiren schools of Buddhism were established. For many East Asian Buddhists, the Lotus Sūtra contains the ultimate and complete teaching of the Buddha and the recitation of the text is understood to bring auspicious fortune and eradicate ones accumulated negative karma. According to Teiser and Stone, there is consensus about the stages of composition but not about the dating of these strata. Tamura argues that the first stage of composition, chapter 2-9, was completed around 50 CE and expanded by chapter 10-21 around 100 CE. He dates the third stage, chapter 22-27, around 150 CE. chapter 2-9 is the earliest stratum. The first layer of this stratum includes the tristubh verses of these chapters which may have been transmitted orally in a Prakrit dialect. The second layer consists of the sloka verses and the prose of chapter 2-9.
chapter 1, 10-20, 27, and a part of chapter 5[note 2] that is missing in Kumarajivas translation. chapter 21-26 and the section on Devadatta in chapter 11 of the Sanskrit version. The Lotus Sutra of the Correct Dharma, in ten volumes and twenty-seven chapters, translated by Dharmarakṣa in 286 CE. The Lotus Sutra of the Wonderful Dharma, in eight volumes and twenty-eight chapters, translated by Kumārajīva in 406 CE. The Supplemented Lotus Sutra of the Wonderful Dharma, in seven volumes and twenty-seven chapters, a revised version of Kumarajivas text, translated by Jnanagupta and Dharmagupta in 601 CE. 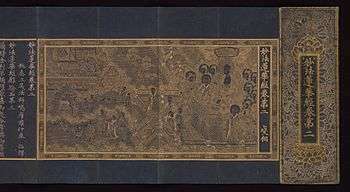 The Lotus Sūtra was originally translated from Sanskrit into Chinese by Dharmarakṣa, aka Zhu Fahu, in 286 CE in Chang'an during the Western Jin Period (265-317 CE). However, the view that there is a high degree of probability that the base text for that translation was actually written in a Prakrit language has gained widespread acceptance. Jan Nattier has recently summarized this aspect of the early textual transmission of such Buddhist scriptures in China thus, bearing in mind that Dharmarakṣa's period of activity falls well within the period she defines: "Studies to date indicate that Buddhist scriptures arriving in China in the early centuries of the Common Era were composed not just in one Indian dialect but in several . . . in sum, the information available to us suggests that, barring strong evidence of another kind, we should assume that any text translated in the second or third century AD was not based on Sanskrit, but one or other of the many Prakrit vernaculars." It may have originally been composed in a Prakrit dialect and then later translated into Sanskrit to lend it greater respectability. This early translation by Dharmarakṣa was superseded by a translation in seven fascicles by Kumārajīva in 406 CE. According to Jean-Noël Robert, Kumārajīva relied heavily on the earlier version. The Sanskrit editions are not widely used outside of academia. In some Chinese and Japanese sources the Lotus Sūtra has been compiled together with two other sutras which serve as a prologue and epilogue, respectively the Innumerable Meanings Sutra (Chinese: 無量義經; pinyin: Wúliángyì jīng Muryōgi kyō) and the Samantabhadra Meditation Sutra (Chinese: 普賢經; pinyin: Pǔxián jīng, Fugen kyō). This composite sutra is often called the Threefold Lotus Sutra or Three-Part Dharma Flower Sutra (Chinese: 法華三部経; pinyin: Fǎhuá Sānbù jīng, Hokke Sambu kyō). The first French translation of the Lotus Sutra, based on a Nepalese Sanskrit manuscript, was published by Eugène Burnouf in 1852. Hendrik Kern completed his English translation of an ancient Nepalese Sanskrit manuscript in 1884. Later translations into English, French, Spanish and German are based on Kumarajivas Chinese text. Illustrated Lotus Sūtra handscroll, Kamakura period, c. 1257; ink, color, and gold on paper. Ch. 1, Introduction - During a gathering at Vulture Peak, Shakyamuni Buddha goes into a deep meditation, the earth shakes in six ways, and he brings forth a ray of light which illuminates thousands of buddha-fields[note 3] in the east. Bodhisattva Manjusri then states that the Buddha is about to expound his ultimate teaching. Ch. 2, Ways and Means - Shakyamuni explains his use of skillful means to adapt his teachings according to the capacities of his audience. He reveals that the ultimate purpose of the Buddhas is to cause sentient beings "to obtain the insight of the Buddha" and "to enter the way into the insight of the Buddha". Ch. 3, A Parable - The Buddha teaches a parable in which a father uses the promise of various toy carts to get his children out of a burning house. Once they are outside, he gives them all one large cart to travel in instead. This symbolizes how the Buddha uses the Three Vehicles: Arhatship, Pratyekabuddhahood and Samyaksambuddhahood, as skillful means to liberate all beings - even though there is only one vehicle. The Buddha also promises Sariputra that he will attain enlightenment. Ch. 4, Faith and Understanding - Four senior disciples address the Buddha. They tell the parable of the poor son and his rich father, who guides him with pedagogically skillful devices to regain self-confidence and "recognize his own Buddha-wisdom". Ch. 5, Parable of the plants - This parable says that the Dharma is like a great monsoon rain that nourishes many different kinds of plants who represent Śrāvakas, Pratyekabuddhas, and Bodhisattvas, and all beings receiving the teachings according to their respective capacities. Ch. 6, Assurances of Becoming a Buddha - The Buddha prophesizes the enlightenment of Mahakasyapa, Subhuti, Mahakatyayana and Mahamaudgalyayana. Ch. 7, The Magic City - The Buddha teaches a parable about a group of people seeking a great treasure who are tired of their journey and wish to quit. Their guide creates a magical phantom city for them to rest in and then makes it disappear. The Buddha explains that the magic city represents the "Hinayana nirvana" and the treasure is buddhahood. Ch. 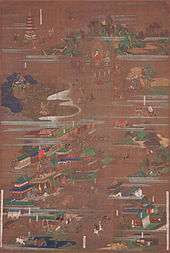 8, Assurances for 500 Arhats. - 500 Arhats are assured of their future Buddhahood. They tell the parable of a man who has fallen asleep after drinking and whose friend sews a jewel into his garment. When he wakes up he continues a life of poverty without realizing he is really rich, he only discovers the jewel after meeting his old friend again. The hidden jewel has been interpreted as a symbol of Buddha-nature. Zimmermann noted the obvious similarity with the nine parables in the Tathāgatagarbha Sūtra that illustrate how the indwelling Buddha in sentient beings is hidden by negative mental states. Ch. 9, Assurances for the Trainees and Adepts. - Ananda, Rahula and two thousand Śrāvakas are assured of their future Buddhahood. Ch. 10, Teacher of the Dharma - Presents the practices of teaching the sutra which includes accepting, embracing, reading, chanting, writing, explaining, propagating it, and living in accordance with its teachings. Ch. 11, The Treasure stupa - A great jeweled stupa rises from the earth and floats in the air; a voice is heard from within praising the Lotus Sūtra. Another Buddha resides in the tower, the Buddha Prabhūtaratna (Many-Treasures) and that there are other countless Buddhas in the ten directions, who are now also summoned by the Buddha. This chapter reveals the existence of multiple Buddhas at the same time and the doctrine of the eternal nature of Buddhahood. Ch. 12, Devadatta - Through the stories of the Dragon King's daughter and Devadatta, the Buddha teaches that everyone can become enlightened - women, animals, and even the most sinful murderers. Ch. 13, Encouragement to uphold the sutra - The Buddha encourages all beings to embrace the teachings of the sutra in all times, even in the most difficult ages to come. The Buddha prophesizes that six thousand nuns who are also present will become Buddhas. Ch. 14, Peace and Contentment - This chapter explains that even though life is filled with challenges, if we practice the dharma diligently through thoughts, words, and deeds, we can be peaceful, joyful and content. Virtues such as patience, gentleness, a calm mind, wisdom and charity are to be cultivated. Ch. 15, Springing Up from the Earth - In this chapter countless bodhisattvas spring up from the earth, ready to teach, and the Buddha declares that there have been innumerable bodhisattvas propagating the dharma for aeons. This confuses some disciples including Maitreya, but the Buddha affirms that he has taught all of these bodhisattvas himself. Ch. 16, The eternal lifespan of the Tathagata - The Buddha explains that he is truly eternal and omniscient. He then teaches the Parable of the Excellent Physician who entices his sons into taking his medicine by feigning his death. Ch. 17, Merits and Virtues of enlightenment - The Buddha explains that since he has been teaching as many beings as the sands of the Ganges have been saved. Ch. 18, Merits and Virtues of Joyful Acceptance - Faith in the teachings of the sutra brings much merit and lead to good rebirths. Ch. 19, Merits and Virtues obtained by a Teacher of the Dharma - The relative importance of the merits of the six senses are explained by the Buddha. Ch. 20, The Bodhisattva Sadāparibhūta - The Buddha tells a story about the time he was a Bodhisattva called Sadāparibhūta (Never Despising) and how he treated every person he met, good or bad, with respect, always remembering that they will too become Buddhas. Ch. 21, The Spiritual Power of the Tathagata - Reveals that the sutra contains all of the Eternal Buddha’s secret spiritual powers. The bodhisattvas who have sprung from the earth worship the sutra and promise to propagate it. Ch. 22, The Passing of the Commission - The Buddha transmits the Lotus Sutra to his congregation and entrusts them with its safekeeping. Ch. 23, The Bodhisattva Bhaiṣajyarāja - The Buddha tells the story of the 'Medicine king' Bodhisattva, who, in a previous life, burns his body as a supreme offering to the Buddha. The hearing and chanting of the Lotus sutra is also said to cure diseases. The Buddha uses various metaphors to declare that the Lotus Sutra is the king of all sutras. Ch. 24, The Bodhisattva Gadgadasvara - The Bodhisattva "Wonderful Voice" appears to worship the Buddha and his story is told. Ch. 25, The Bodhisattva Avalokiteśvara - This chapter is devoted to Avalokiteśvara, describing him as a compassionate bodhisattva who hears the cries of sentient beings, and rescues those who call upon his name. Ch. 26, Dhāraṇī - Hariti and several Bodhisattvas offer sacred formulae (dhāraṇī) in order to protect those who keep and recite the Lotus Sutra. Ch. 27, King Wonderfully Adorned - A chapter on the conversion of King 'Wonderful-Adornment' by his two sons. Ch. 28, Encouragement of the Bodhisattva Samantabhadra - A bodhisattva called "Universal Virtue" asks the Buddha how to preserve the sutra in the future. Samantabhadra promises to protect and guard all those who keep this sutra in the future Age of Dharma Decline. 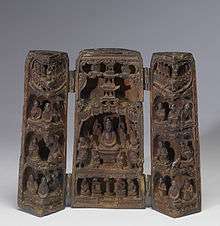 Portable shrine depicting Buddha Sakyamuni preaching the Lotus Sūtra. The Walters Art Museum. Although the corpus of teachings attributed to the Buddha, if taken as a whole, embodies many contradictions, these contradictions are only apparent. Teachings are appropriate to the context in which they are given and thus their contradictions evaporate. The Buddha’s teachings are to be used like ladders, or, to apply an age-old Buddhist image, like a raft employed to cross a river. There is no point in carrying the raft once the journey has been completed and its function fulfilled. When used, such a teaching transcends itself. The sutra emphasizes that all these seemingly different teachings are actually just skillful applications of the one dharma and thus all constitute the "One Buddha Vehicle and knowledge of all modes". The Lotus sutra sees all other teachings are subservient to, propagated by and in the service of the ultimate truth of the One Vehicle leading to Buddhahood. The Lotus Sūtra also claims to be superior to other sūtras and states that full Buddhahood is only arrived at by exposure to its teachings and skillful means. Chapter ten of the Burton Watson translation states: "...Medicine King, now I say to you, I have preached various sutras, and among those sutras the Lotus is foremost!" The Lotus Sutra is also significant because it reveals that women, evil people and even animals and plants have the potential to become Buddhas. It in fact teaches that beings have the potential become Buddhas in their present form, and provides instructions including: having faith in, following and practicing, not slandering, and truly refuting any slander of it and its teachings. That is, with the Lotus Sutra, people need neither practice austerities for countless kalpas nor wait for rebirth in a different physical form to become a Buddha (previous teachings held that women must be reborn as men and then practice for innumerable kalpas in order to become Buddhas). Thus through its many similes and parables, the Lotus sutra affirms the potential for all beings to become Buddhas, and furthermore provides instructions for all beings to becoming a Buddha in the present life. The Lotus Sutra also teaches that the Buddha has many embodiments or emanations and these are the countless bodhisattva disciples. These bodhisattvas choose to remain in the world to save all beings and to keep the teaching alive. According to Gene Reeves: "Because the Buddha and his Dharma are alive in such bodhisattvas, he himself continues to be alive. The fantastically long life of the Buddha, in other words, is at least partly a function of and dependent on his being embodied in others." The Lotus sutra also teaches various dhāraṇīs or the prayers of different celestial bodhisattvas who out of compassion protect and teach all beings. The lotus flower imagery points to this quality of the bodhisattvas. 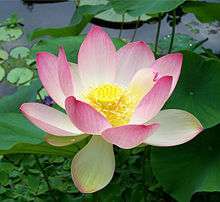 The lotus symbolizes the bodhisattva who is rooted in the earthly mud and yet flowers above the water in the open air of enlightenment. The universe outlined by the Lotus Sutra encompasses realms of gods, devas, dragons[note 4] and other mythological beings, requiring numerous dimensions to contain them. Buddhas are described as the patient teachers of all beings, who constantly guide all beings to enlightenment. The radical message of the Lotus Sutra therefore includes the fact that all beings have the potential to become Buddhas and teach the dharma here and now. Another concept introduced by the Lotus Sūtra is the idea that the Buddha is an eternal entity, who achieved nirvana eons ago, but remains in the world to help teach beings the Dharma time and again. He reveals himself as the "father" of all beings and evinces the loving care of just such a father. Moreover, the sutra indicates that even after the parinirvana (apparent physical death) of a Buddha, that Buddha continues to be real and to be capable of communicating with the world. In this way, since my attainment of Buddhahood it has been a very great interval of time. My life-span is incalculable asatkhyeyakalpas [rather a lot of aeons], ever enduring, never perishing. O good men! The life-span I achieved in my former treading of the bodhisattva path even now is not exhausted, for it is twice the above number. Yet even now, though in reality I am not to pass into extinction [enter final nirvana], yet I proclaim that I am about to accept extinction. By resort to these expedient devices [this skill-in-means] the Thus Come One [the Tathagata] teaches and converts the beings. Calligraphic mandala (Gohonzon) inscribed by Nichiren in 1280. The central characters are the title of the Lotus sutra. According to Jonathan Silk, the influence of the Lotus Sutra in India may have been limited, but "it is a prominent scripture in East Asian Buddhism." The sutra has most prominence in Tiantai (sometimes called "The Lotus School") and Nichiren Buddhism. It is also very influential in Zen Buddhism. Tao Sheng, a fifth-century Chinese Buddhist monk wrote the earliest commentary on the Lotus sutra. Tao Sheng was known for promoting the concept of Buddha nature and the idea that even deluded people will attain enlightenment. Zhiyi, the generally credited founder of the Tiantai school of Buddhism, was the student of Nanyue Huisi who was the leading authority of his time on the Lotus Sūtra. Zhiyi's philosophical synthesis saw the Lotus sutra as the final teaching of the Buddha and the highest teaching of Buddhism. He wrote two commentaries on the sutra: Profound meanings of the Lotus sutra and Words and phrases of the Lotus sutra. Zhiyi also linked the teachings of the Lotus sutra with the Buddha nature teachings of the Mahāyāna Mahāparinirvāṇa Sūtra and made a distinction between the "Eternal Buddha" Vairocana and the manifestations. In Tiantai, Vairocana (the primeval Buddha) is seen as the 'Bliss body' - Sambhogakāya - of the historical Gautama Buddha. Consequently, the Lotus Sūtra is a very important sutra in Tiantai and correspondingly, in Japanese Tendai (founded by Saicho, 767–822). Tendai Buddhism was the dominant form of mainstream Buddhism in Japan for many years and future proponents of the Lotus Sūtra Nichiren and Dogen were trained as Tendai monks. Nichiren, a 13th-century Japanese Buddhist monk, founded an entire school of Buddhism based on his belief that the Lotus Sūtra was "the Buddha´s ultimate teaching", and that it "contained the essence of the Buddha's enlightenment and that it held the key to transforming people's suffering and enabling society to flourish." Nichiren held that chanting the name of the Lotus sutra - Namu Myōhō Renge Kyō - was the only way to practice Buddhism in the degenerate age of mappo and was the highest practice of Buddhism. In the modern era Nichiren Buddhism has been influential through lay movements such as the Risshō Kōsei Kai and Soka Gakkai. Dogen, the 13th-century Japanese founder of Sōtō Zen Buddhism, used the Lotus Sūtra often in his writings. According to Taigen Dan Leighton, "While Dogen's writings employ many sources, probably along with his own intuitive meditative awareness, his direct citations of the Lotus Sūtra indicate his conscious appropriation of its teachings as a significant source" and that his writing "demonstrates that Dogen himself saw the Lotus Sutra, 'expounded by all buddhas in the three times,' as an important source for this self-proclamatory rhetorical style of expounding." In his Shobogenzo, Dogen directly discusses the Lotus sutra in the essay Hokke-Ten-Hokke, "The Dharma Flower Turns the Dharma Flower". The essay uses a dialogue from the Platform Sutra between Huineng and a monk who has memorized the Lotus sutra to illustrate the non-dual nature of dharma practice and sutra study. 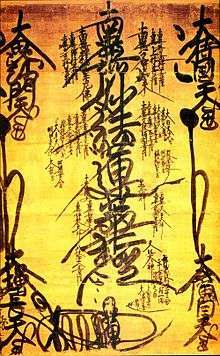 The Soto Zen monk Ryōkan also studied the Lotus Sutra extensively and this sutra was the biggest inspiration for his poetry and calligraphy. The Rinzai Zen master Hakuin Ekaku achieved enlightenment while reading the third chapter of the Lotus Sutra. Hokke Gisho, an annotated Japanese version of the sutra. ↑ Chapter numbers of the extant Sanskrit version are given here. The arrangement and numbering of chapters in Kumarajivas translation is different. ↑ In the Sanskrit manuscripts chapter 5 contains the parable of a blind man who refuses to believe that vision exists. ↑ Sanskrit buddhaksetra, the realm of a Buddha. "Impure buddha-fields are synonymous with a world system (cacravada), the infinite number of “world discs” in Buddhist cosmology that constitutes the universe (...)." ↑ The eight dragons who are mentioned in the Lotus Sutra, are known in Japan as the hachidai ryuuou (八大竜王), and appear throughout Japanese Buddhist art. ↑ Pye 2003, p. 177-178. ↑ Pye 2003, p. 173-174. ↑ Teiser 2009, p. 7-8. ↑ Kajiyama 2000, p. 73. ↑ Karashima 2015, p. 163. ↑ Apple 2012, pp. 161-162. ↑ Bingenheimer 2009, p. 72. ↑ Kern 1852, pp. 129-141. ↑ Reeves 2008, p. 2. 1 2 The English Buddhist Dictionary Committee 2002. ↑ Ryodo 1989, p. 25. ↑ Stone 2003, p. 471. ↑ Karashima 1988, p. VIII. ↑ Zürcher 2006, p. 57-69. ↑ Nattier 2008, p. 22. ↑ Watson 1993, p. IX. ↑ Karashima 2001, p. VII. ↑ Robert 2011, p. 63. ↑ Jamieson 2002, pp. 165–173. ↑ Cole 2005, p. 59. ↑ Hirakawa 1990, p. 286. ↑ Suguro 1998, p. 4. ↑ Buswell 2013, pp. 290. ↑ Yuyama 2000, pp. 61-77. ↑ Vetter 1999, pp. 129-141. ↑ Buswell 2013, p. 153. ↑ Suguro 1998, p. 19. ↑ Kern 1884, p. 7. ↑ Apple 2012, p. 162. ↑ Suguro 1998, p. 31. ↑ Suguro 1998, pp. 34-35. ↑ Pye 2003, p. 23. ↑ Groner 2014, pp. 8-9. ↑ Williams 1989, p. 155. ↑ Pye 2003, p. 37-39. ↑ Pye 2003, p. 40-42. ↑ Pye 2003, p. 42-45. ↑ Pye 2003, p. 48. 1 2 Williams 1989, p. 156. ↑ Federman 2009, p. 132. ↑ Lopez 2015, p. 29. ↑ Pye 2003, p. 46. ↑ Lopez 2015, p. 28. ↑ Wawrytko 2007, p. 74. ↑ Buswell 2013, p. 654. 1 2 Strong 2007, p. 38. ↑ Teiser 2009, p. 12. ↑ Pye 2003, p. 51-54. ↑ Williams 1989, p. 157. ↑ Williams 1989, p. 160. ↑ Chün-fang 1997, p. 414-415. ↑ Baroni 2002, p. 15. ↑ Wang 2005, p. 226. ↑ Murano 1967, pp. 76-78. ↑ Suguro 1998, p. 170. ↑ Wang 2005, pp. XXI-XXII. ↑ Ryodo 1989, p. 30. ↑ Murano 1967, pp. 81-83. ↑ The Walters Art Museum. ↑ Williams 1989, p. 151. ↑ Shiki 1983, p. 17. ↑ Hurvitz 1976, p. 239. ↑ Silk 2001, pp. 87,90,91. 1 2 Kirchner 2009, p. 193. ↑ "The Final Word: An Interview with Jacqueline Stone". Tricycle: The Buddhist Review. 2006. Retrieved April 27, 2013. ↑ Kim 1985, pp. 3. 1 2 3 Williams 1989, p. 162. ↑ Groner 2000, pp. 199–200. ↑ Tanahashi 1995, p. 4. ↑ Stone 2009, p. 220. ↑ "Who is Nichiren Daishonin?". SGI USA. Retrieved April 27, 2013. 1 2 Leighton 2005, pp. 85–105. ↑ Leighton 2007, pp. 85–105. ↑ Yampolsky 1971, pp. 86-123. Baroni, Helen Josephine (2002). The Illustrated Encyclopedia of Zen Buddhism. The Rosen Publishing Group. ISBN 978-0-8239-2240-6. Burnouf, Eugène (tr.) (1852). Le Lotus de la Bonne Loi: Traduit du sanskrit, accompagné d'un commentaire et de vingt et un mémoires relatifs au Bouddhisme. Paris: Imprimerie Nationale. Chün-fang, Yü (1997). "Ambiguity of Avalokiteśvara and the Scriptural Sources for the Cult of Kuan-Yin in China" (PDF). Chung Hwa Journal of Buddhism. 10: 409–463. Jamieson, R.C. (2002). Introduction to the Sanskrit Lotus Sutra Manuscripts, Journal of Oriental Studies 12 (6), 165–173. Karashima, Seishi (1998). A Glossary of Dharmarakṣa’s Translation of the Lotus Sūtra, Bibliotheca Philologica et Philosophica Buddhica, Vol. I, The International Research Institute for Advanced Buddhology, Tokyo, p. VIII, ISBN 4-9980622-0-4. Strong, John (2007). Relics of the Buddha. Motilal Banarsidass Publishe. ISBN 978-81-208-3139-1. Tanabe, George J.; Tanabe, Willa Jane (ed.) (1989). The Lotus Sutra in Japanese Culture. Honolulu: University of Hawaii Press. ISBN 0-8248-1198-4. Tola, Fernando, Dragonetti, Carmen (2009). Buddhist positiveness: studies on the Lotus Sūtra, Delhi: Motilal Banarsidass Publ. ISBN 978-81-208-3406-4.